Don't be fooled! The following post concerns the ideological competition between 2016 candidates Hillary Clinton (funded by banks and other corporate interests) and Bernie Sanders (funded by We the People), who represent two wings of the Democratic Party. The Establishment/corporate wing focuses our resources upon global conquest and occupation that leads to Global Government while the Democratic Socialist/Progressive wing of Senator Sanders focuses on the needs and desires of the American people. Charity, as they say, begins at home yet Washington and the Pentagon have already caused a massive and dire need for charity here and across the nations via the racket of perpetual war and mayhem. And it's ugly to say, but depopulation is a corporate goal as well. 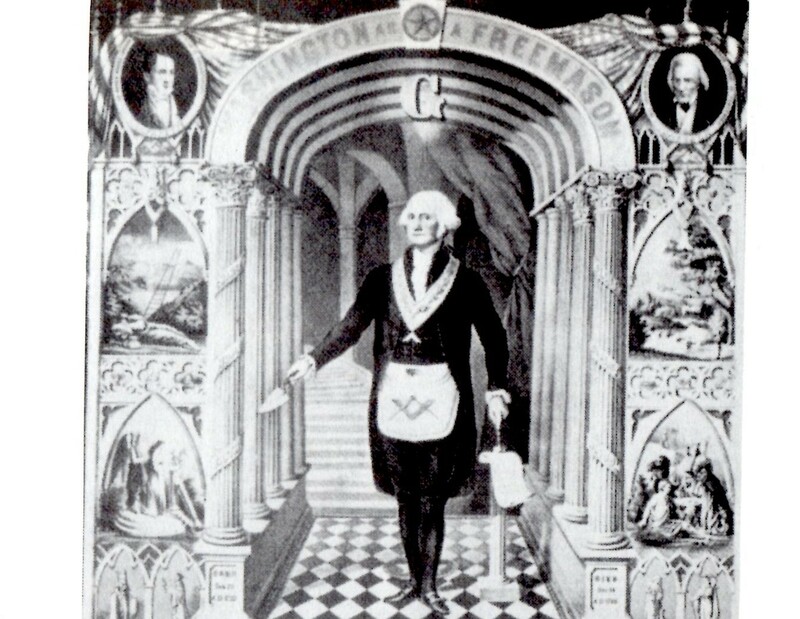 Now if you wish, check out a video of 39th President Jimmy Carter's Inauguration Address on YouTube where he emphasizes taking the Oath of Office on the family Bible his mother gave him and with the same Bible used by Freemason George Washington at his swearing in of 1789 (see chart, below; the Masonic Bible was in the care of St. John Lodge No. 1 in 1977). And of course, General Washington was of the Hamilton Central Bank persuasion which invited the corporate fox into the hen house, ginned up since December 1913 when Congress surreptitiously passed the Federal Reserve Act and gifted our legislative branch of government to a bunch of international bankers. 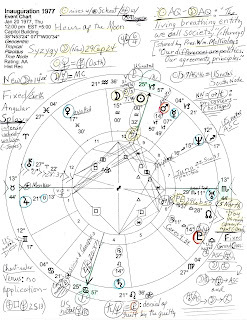 For your convenience, Washington's April 30, 1789 Inauguration Horoscope is shown, below, with my original scribbles and a link to more details. Note 1789's YOD pattern (special purpose; turning point which is notated on the image, upper right: Saturn-MC = Neptune: 'formal roles imposed on the executive branch' (Munkasey) peculiar circumstances (Ebertin); feeling fearful (Tyl). The Saturn-MC combo denotes important people--those we might call VIPs. You may wish to read more information on Jimmy Carter's 1977 Inauguration Wiki page where you'll find details such as the Bible verse that he featured, Micah 6:8: "He hath shown thee, O man, what is good and what doth the Lord require of thee, but to do justly, and to love mercy, and to walk humbly with thy God." The presidency and life of Jimmy Carter may evoke this verse yet tragically America is overly and expansively Jupiterian and our government seldom if ever admits mistake, falsehood, injustice, or defeat. As you know, Jupiter (Zeus) was a god king in Mythology and there was a huge statue created of George Washington as 'Zeus' plus, the US Capitol Dome depicts The Apotheosis of George Washington--into divinity on high with the other 'gods' and symbols. 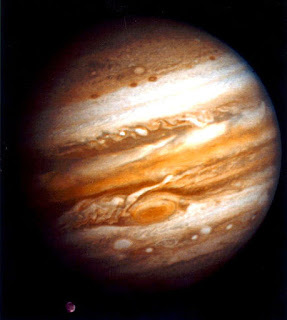 Hopefully, Jupiter-Zeus isn't the 'god' Jimmy Carter refers to in spite of his inaugural links to Freemason George Washington. And here is the full text of Carter's "faith in the old dream" Inaugural Address of 1977, America's cult of personality notwithstanding. My fret is that the 'old dream' he lauds is a reference to Plato's Ideal, the Utopian Atlantis. 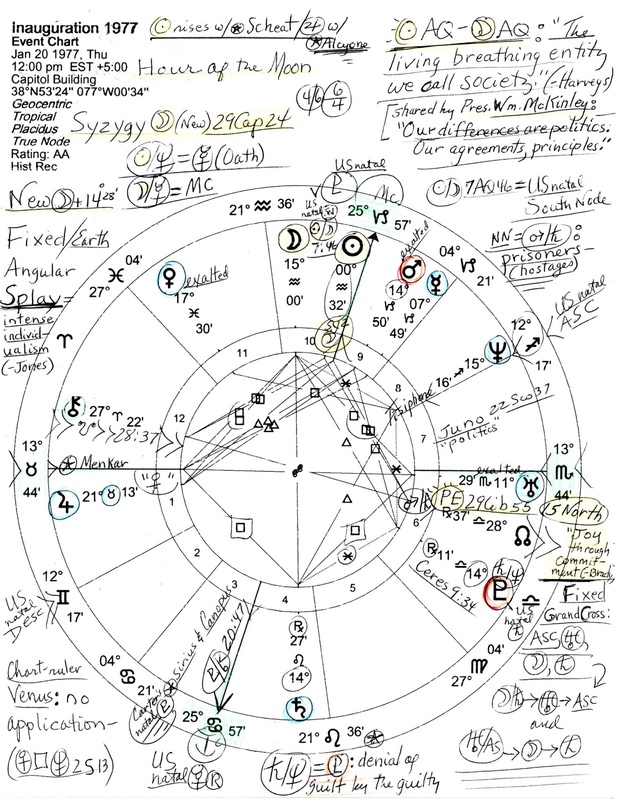 The planet of bankers, investors, and Corporatism rises in first house denoting Jupiter in money sign Taurus as an early issue he deal with and there's Mars @14Cap50 (in the 9th house of Foreigners) aiding financial issues by trining Jupiter. 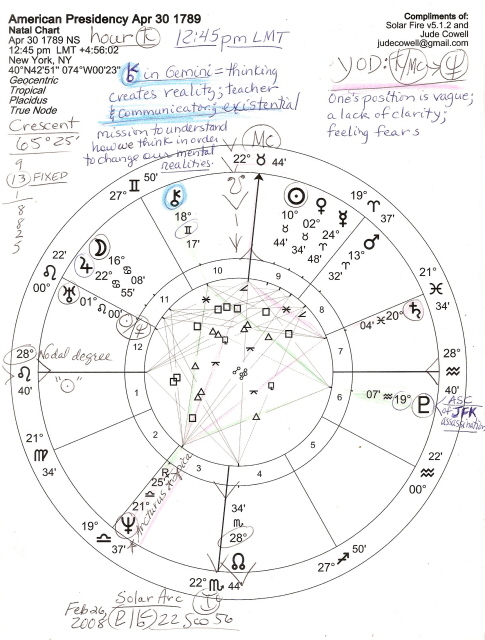 Simultaneously, Jupiter rules the 8th house of Corporatism and Shared Resources while the 8th cusp shows fraudulent yet divienly inspired Neptune (ruled by Jupiter!) on the cusp but inside the 8th house. Asteroid Tisiphone is traveling with veiling Neptune and indicates retaliation of some kind. How much did you say we paid Tehran to release our hostages? 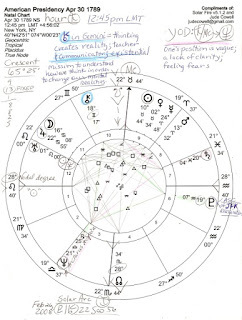 In addition, US natal Pluto @27Cap33 is at the IC (the HOW? Point) as usual since 1937 when January 20th became our Inauguration date, and 1977 Pluto in the 6th house of Work, Health, and Service (Military, Police, and Civil) conjoins US natal Saturn (14Lib48), a time when structures and traditions are seriously altered by current circumstances and the past returns to haunt especially in the realms of power and control. Seems that Pluto's secret cave of hidden treasure was brought to Capitol Hill on the Democratic side of the aisle if this 'corporate turning point' theory is correct and can be timed by Inauguration 1977. 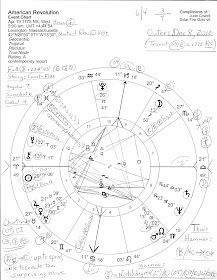 Another chart factor about Pluto is that he is the apex of a midpoint picture with the Socialism-Capitalism-Marxism/invisible-government pair, Saturn-Neptune denoting potentials such as: denial of guilt by the guilty, fear of loss (Tyl), and new ideas about historical theories (Munkasey.) I can think of one: why should the Republicans be the only politicians benefiting from corporate largess? Now of course there is so much more to say about the 1977 Horoscope but I count on your eagle eye to spot pertinent factors for yourself. Does a corporate take-over of the Democratic Party show in this chart? For me it does and at the least, the timing and the event cannot be ruled out. So let's close this segment with Inauguration 1977's humanitarian Sun AQ-Moon AQ blend, a double Air combination of conscious mind + the unconscious energies. It is shared natally by President William McKinley and if you look upper right you can read one of the blend's 'Images for Integration': "The living, breathing entity we call society (the Harveys). "Our differences are politics. Our agreements, principles." How tiresome are Washington DC's political antics and charades? The American public must be totally exhausted for Campaign 2016 is now topped with Bernie Sanders and Donald Trump and both can fulfill Venus' someone different requirement on November 8th! As you know, the Camp David Accords between Egypt and Israel are together generally touted as a major achievement of President Jimmy Carter's administration. Although the Accords (plural) were signed in two phases it's the September 18, 1978 announcement to a Joint Session of Congress that resonates with a significant event in US history: the ceremonial laying of the Capitol Building cornerstone (the building in which Carter's announcement was made) on September 18, 1793. Synchronized Freemason stuff meant to 'time link' them together? Possibly, or to suggest that the 1787 and 1978 signings were of the same ilk and historical importance? Well, through the years both events and their results have been undermined by opponents, haven't they? As Lenin asserted, "Fascism Is Capitalism in Decay", and, "One cannot be a revolutionary Social–Democrat without participating, according to one’s powers, in developing this theory [Marxism], and adapting it to changed conditions." So an adapted Marxism is the goal of America's Saturn-Neptune snugged around our Midheaven (Goal Point) of 1776?